The cypher is a five point harmonic chart pattern, made up of points XABCD. The cypher is easy to spot on a chart because it has a characteristic wave like appearance displaying either rising peaks or falling valleys. 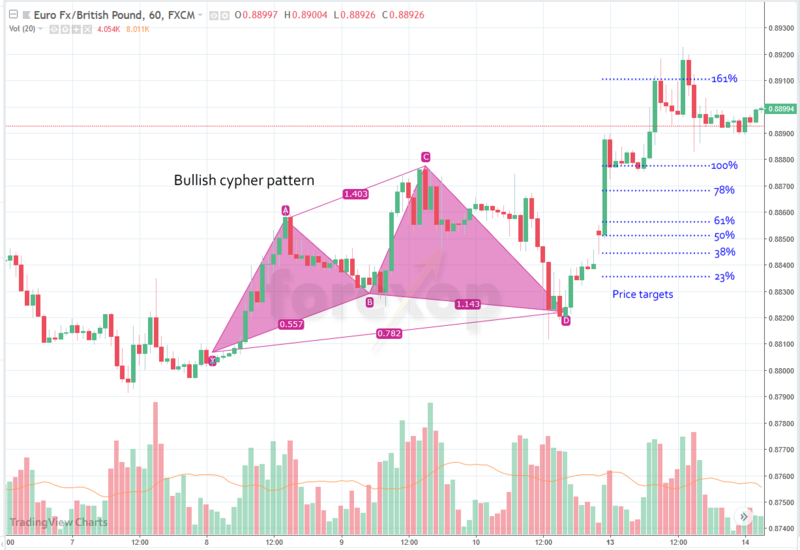 You can trade the cypher like other harmonic patterns, by waiting for a reversal at the final point and then using pending orders to profit from any potential breakout. In any cypher, points X, C and D are the critical points. For a bullish cypher, X should be the pattern low and C the pattern high. A bearish cypher makes its high at X and its low at C.
In the bullish cypher, the points A and C should make successively higher highs and point D must be above X. In the bearish cypher points A and C must make successively lower lows and point D should be below X. The reversal is expected at point D, the final point in the pattern. Always allow a tolerance of a few percent around these numbers as they will rarely be exact. The cypher has a slightly different appearance to the butterfly, bat and gartley. In a cypher, C makes a stronger rebound beyond A and that gives the appearance of rising peaks in the bullish cypher and falling valleys in the bearish cypher. The cypher is a technical wave pattern in which the market is trending but is making sharp reversals along the way. The key point of the bullish cypher is that both the lows and the highs are trending upwards. In the bearish pattern, the opposite happens. As downward momentum increases the highs and lows at each reversal point are progressively lower. If the cypher completes successfully with a reversal taking place at point D, it may eventually become a trend channel where the price oscillates between the highs and lows. Cyphers can also appear inside price channels that are already established. To trade the bullish cypher, first confirm that the points XABC are in alignment with the correct ratios. Next wait for the price to reach point D. Once the price touches point D enter a buy stop order with an entry price higher than D. A buy stop will only execute if the price rebounds high enough from D to reach the entry price. The order expires if the market doesn’t reach the entry price within a certain time limit. An appropriate setting is about ½ of the time between C and D. With order expiries, the trade is abandoned if the market stays bearish and the retracement at D extends deeper. 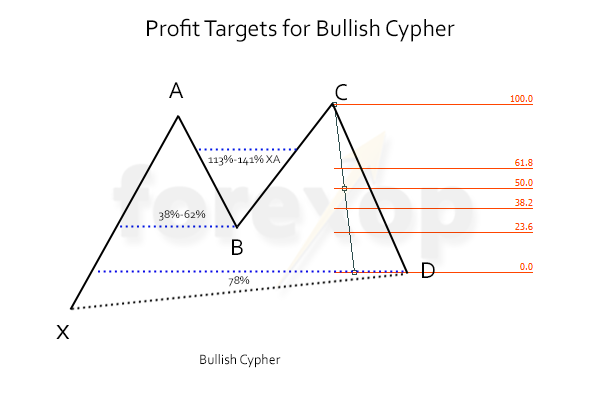 Set the price targets for the cypher at the Fibonacci reversal lines between point D and point C. To work out the precise targets use a Fibonacci retracement tool and mark the points on the chart between D and C.
The tool should display the retracement lines at the appropriate Fibonacci ratios of 0%, 23%, 38%… and 100% which should be horizontally level with C.
If the breakout occurs expect these lines develop into support and resistances areas. See Figures 2 and 3. Once the breakout starts, scale up the position size using a pyramid or grid method only if the bullish trend extends at D.
It’s very improbable that the price will extend in a straight line from D. What happens more often is that one or two false breakouts happen, sometimes in both directions. Using a scaled entry is less risky because the exposure only increases if the trend shows more strength on the bullish side. If there isn’t a clear breakout at D within the time limit, it’s safest to wait for a better opportunity. Figure 3 shows a bullish cypher on the EURGBP hourly chart. We place the first buy stop order after the price first reaches D. Then set the entry price for the order to be near the first price target at 23% and the stop loss at X. The breakout at D triggers the first buy order once the price crosses the first retracement line. This creates a new order with an entry price at the 38% line. After reaching the 38% target, the stop loss for the first order shifts up and a new order is sent for the next target and so on. The long position grows like this only if the trend extends in a bullish trajectory from D. The trade aborts if the price falls below X in the breakout area instead of rebounding upwards at D. That can be either due to the stop losses or the expiry of the stop orders. Take profit occurs when the stop losses are activated. 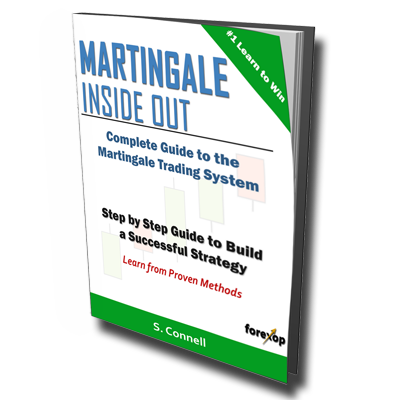 In this example notice that the profit targets turn into areas of support and resistance.